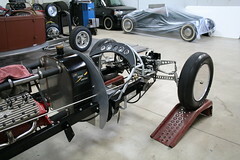 Home/Car Stories/So-Cal Speed Shop’s Historical Belly Tanker Stripped Naked! So-Cal Speed Shop’s Historical Belly Tanker Stripped Naked! When we go on tour it is usually to a museum or an event. This time it was quite different but very exciting. We went to the So-Cal Speed Shop headquarters and took a tour of the shop. It is wonderful to see old cars and see history in a museum but to see it in the shop were history is being created is very exciting. Not only did we get to see new cars under construction we got to see one of the hobby’s most recognizable stars in the all natural! If you want to see more on that car, the Belly Tanker, you will need to check out our Feature Car page. You can see more images from the So-Cal Speed Shop by going to our On Tour page. I have to thank the guys at So-Cal for being so generous as to open their work place up for tours. If you are like me, going to a body shop or speed shop is almost like going to the movies; its entertainment for me. Luckily, the guys at So-Cal realize they are special; they have made history and they are making history. Having the opportunity to see the inside of their business was a real thrill. The good new, I am no one special you can also enjoy this privilege. Go to their headquarters in Pomona, CA; twice a day and take a tour and its free! Check out their web site for hours and address. Click here to visit So-Cal Speed Shop web site. C-5 Corvette! Remember the fuss when it was new?